Adding flavor to your food is as simple as throwing in some smoker chips. Smoker chips, as the name suggests, are wooden chips that give off flavored smoke when burned. A combination of flavors is even possible when multiple chips are blended together. For directions on how to use smoker chips, turn to your smoker’s instruction manual. You may, however, find that the manual or any recipe book provided with your smoker isn’t quite thorough enough to tell you everything you need to know about flavor. Make sure to check your manual to see if your smoker can only take a certain brand of chips. You may lose your warranty if you violate their rules. Otherwise, using smoker chips isn’t complicated. There are gas and wood chips that you can obtain for your smoker. As long as the brand works with your smoker, you’re in for a whole lot of flavor fun choosing your wood chips! Wood chips come in several flavors and each ones smoke infuses a different taste into the food you’re smoking. Choosing a flavor may seem daunting at first, and rightly so since it can ruin your bbq. 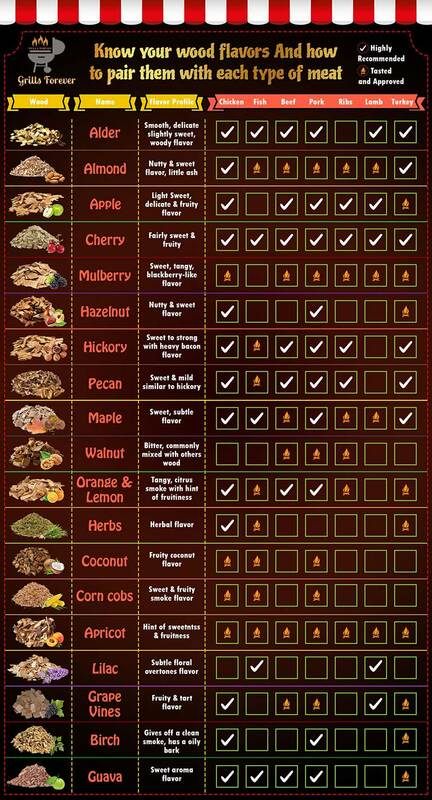 Here is a quick guideline on choosing the perfect wood chips for different meat bbq, followed by detailed descriptions. Select your wood chip for distinctive flavor! Hickory wood chips are the most commonly used chips by professional cooks. Made using hickory wood, these chips give off a little pungent but pleasing aroma. They also mix well with other chips, including pear and apple. Hickory wood chips go great with chicken, beef, pork ribs and other game birds as well as other types of meat. What a BBQ that would make! Known for their delicate, sweet aroma, alder chips are harvested from a hardwood tree which reaches heights of over 645 feet. They’re created using wood with a natural flavor such as ash, cherry, and maple oak. 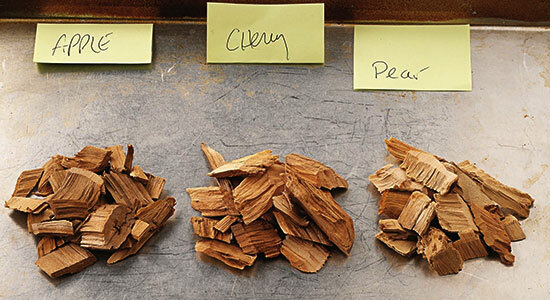 Because of their light flavor, alder chips mix well with fruit chips and hickory. They’re awesome for all types of meats as well as seafood and poultry. Many stores give out free samples of alder wood chips. you can try them before in small quantity if you are unsure about the strong smoky alder flavor. Hardwood smoker chips can be obtained from fruit trees and nuts. They’re also the source of most wood used in grills and smokers, making them as easy to obtain as going to the lumber yard. This isn’t the best idea though, as the lumber could be mixed with other types of wood, such as pine. 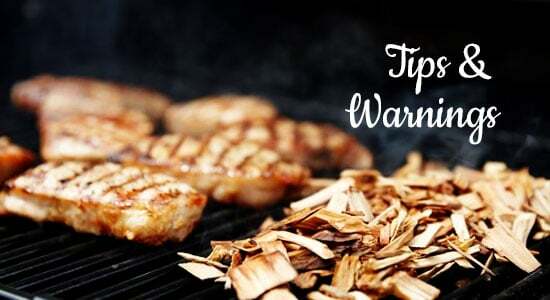 You must also watch out for resin-covered wood, as it will ruin the smoker as well as the food. Hardwood smoker chips are used to cook a variety of things, including seafood, poultry, and all types of meat. 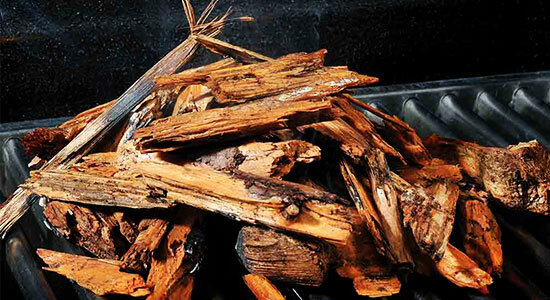 Apple wood chips, as the name suggests, are a fruity smoking chip. They have a light smoke and a delicate sweet flavor. Apple wood chips go perfectly well with almost all type of meats. Pecan wood chips are similar to hickory chips in flavor, yet they are more subtle and sweet. The chips smoke well with poultry, pork, and beef. For something a little different to add to your BBQ, pecan chips also go great with cheese. 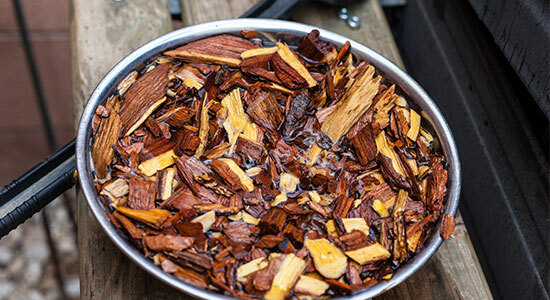 Mesquite wood chips are common in Southwest and Texas-style BBQ. The smoky taste they produce goes wonderfully with red meats, lamb, and poultry. Maple wood chips, like their name suggests, have a slightly smoky taste of maple syrup. This sweetness goes well with poultry, game birds, pork, and cheese. Smoking woods usually come in four sizes: chips, chunks, pellets, and discs. These are all used to achieve different purposes. The size will determine how long they will smoke and smolder. Wood Chips: Wood chips are the most popular. They’re about the size of a large coin. They’re ideal for smoking small cuts of meat or fish. They burn out quickly and are not meant for long cooking sessions. For longer cooking, you want the chunks. Wood Chunks: Wood chunks are the largest of the smoking woods. They’re good for large meats because they burn the longest out of all the sizes. An interesting feature of wood chunks is that they sometimes come with the bark still on them, which adds another layer of flavor that can’t be achieved with the other smoking woods. Wood Pellets: Wood pellets come in pea or rod sizes. They burn quicker than the other three mentioned so far, thus you will have to keep replacing them during use. They’re best for small meats, such as chicken wings. Wood Discs: Wood discs are the last of the smoking woods, but they’re made from compressed sawdust. If you like to recycle, think of these as an eco-friendly way to obtain your smoking wood; they are made from leftover material in sawmills. There are several grills that wood chips can be used in. These include charcoal, gas, electric, pellet, and Tru-Infrared grills. In charcoal grills, charcoal is used as the heat source. Burn the coal until it’s white then add in the wood chips. Once the smoke from the chips is thin and smoldering, put your meat on. 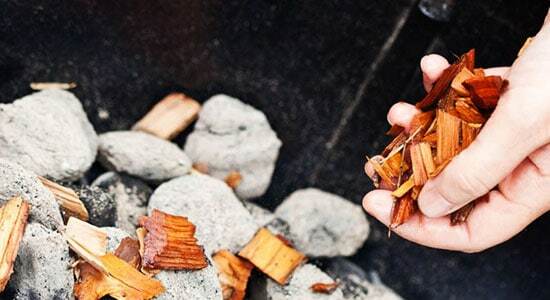 In addition to using the wood chips, you can also add wood chunks to the charcoal to make the fire burn longer. Add a cup or two of wood chips every 45 minutes. Some gas grills come with a special burner for the smoker box. In this case, simply add the damp chips in and fire it up. Should your grill not have its own burner, you can still use wood chips for smoking. A foil pan with aluminum foil covering should do the trick. Electric grills are easy to maintain and are convenient to own. However, they often lack the infusion of flavor that charcoal and gas grills provide. Using a smoker box, put the wood chips inside and place in the center rear of a hot grill. Allow the chips to begin giving off smoke before cooking. Pellet grills are one of the hottest trends in grilling. They offer the convenience of gas grills (set the dial and wait) with the smoky flavor of wood. These grills pre-heat quickly and some even allow you to regulate the temperature in 5-degree increments. They’re a very versatile product, which allows the griller to barbeque, smoke, roast, bake, braise, and even grill. As the name suggests, they’re powered by wood pellets. Grilling with a Tru-Infrared grill is simple. Begin by heating only one side, then adding wood packets. You can make your own by adding wood chips to heavy-duty aluminum foil, sealing the packet, and poking a few holes on top. You can also buy disposable packets or use a smoker box. When the smoke is ready, add on your meat. When it comes to smoking ribs, the best way to find out what tastes best is to experiment. That being said, oak and hickory are the most commonly used woods for smoking ribs. Mesquite is another great wood to try. And since people often enjoy apples in some form with their ribs, apple wood is a tasty sure bet. Soaking Wood Chips: How Long? 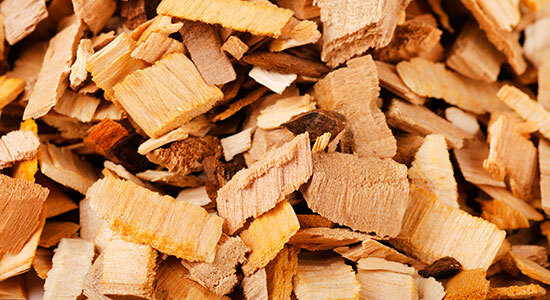 In order to get the best result, it is suggested that wood chips be soaked in water for 30 minutes before using. You can also soak them in wine or juice to add variety to the flavor. Afterward, heat the chips for 10 minutes until they begin giving off smoke before putting food on to cook. Wood Chips: How Often Do I Change Them? A good rule of thumb that we conform to here at Grills Forever is to change smoker wood chips every five to six hours. 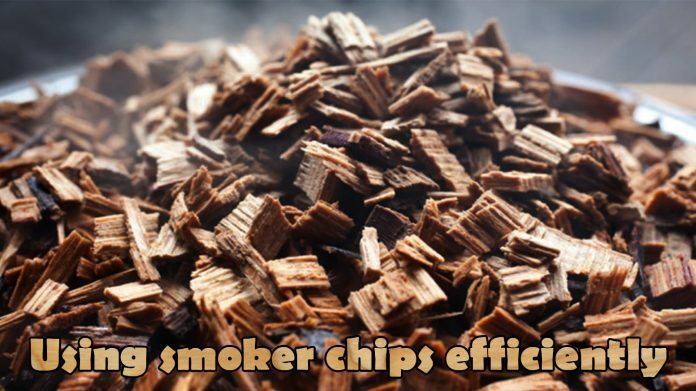 As a beginner, you might find determining the right time to change wood chips hard but the best way to tell if your chips need changing is to check the taste and smoke. If they’re not up to par, it’s time to change your chips. Also, check chips that have been used for over four times for mold. When learning how to use smoker chips in any type of grill, remember to always look at your grill’s instruction manual first. This is so that you can learn the nuances of your grill and what types of wood chips it takes. Once you know all of this, you can get on to preparing your chips. After soaking your wood chips for 30 minutes, drain them before putting them to use. If they’re too wet, they won’t produce the essential smoke needed to cook the meat. Should you happen to be using a wood smoker, it isn’t necessary to immerse the chips in liquid first. While using other types of grills, however, begin your cooking process with wettened chips. Due to the popularity of smoking, many grills have a smoker drawer where you place the (first soaked) chips and then grill away. The smoke from the wood chips in the drawer will infuse your food with flavor. If your smoker doesn’t have a special compartment for wood chips, you can make your own smoker packet with heavy-duty aluminum foil. 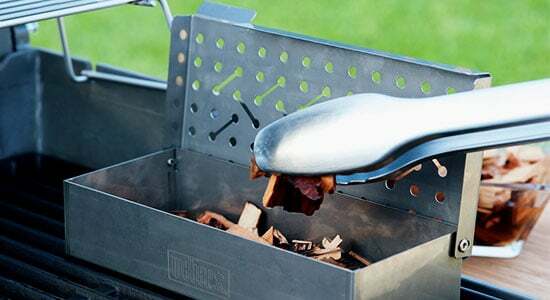 Place the wood chips inside, seal the foil, and using a knife or fork poke some holes on top so the smoke can rise. Now you have your own smoker packet that can be used directly on the grill. Do your research. Each smoker is different and not everyone may fulfill your needs and desires. Once you have purchased your smoker, be sure to read the instruction manual to learn how to use smoker chips in it properly. Make sure you clean out your wood chips every five to six hours and check for mold if you’ve used the same chips four consecutive times. Using wood chips is an easy way to infuse new and exciting flavors into your food. Whether you own a traditional gas or charcoal grill, or have something more fancy like a tru-infrared grill, you can use wood chips whether the grill has a compartment for them or not. Wood chips are extremely versatile. There are chips, chunks, pellets, and discs, and each one is used for different cooking methods. Then, of course, there are several different flavors, many of which can be mixed with others to make a combination of tastes. If you’re looking for a simple means of adding flavor, wood chips are the option for you. Pick a size, choose a flavor (or two), and turn your smoker or grill into a marvel of cooking even a professional would envy. Next articleHow Do You Prevent Your Grill from Rusting? I must convey my admiration for your kind-heartedness giving support to visitors who should have help with that situation. Your real dedication to passing the solution all-around was definitely informative and have in most cases made guys and women like me to attain their ambitions. Your entire warm and friendly facts entails a great deal a person like me and still more to my peers. Regards; from each one of us. Wooh! That was really an overwhelming appreciation that should be working as our motivation to work more efficiently! Love from entire Grillsforever team. How to Clean a Grill: A Guide to a Spotless Grill!